Amanda Sevall Designs: My One Little Word for 2013... Choose. 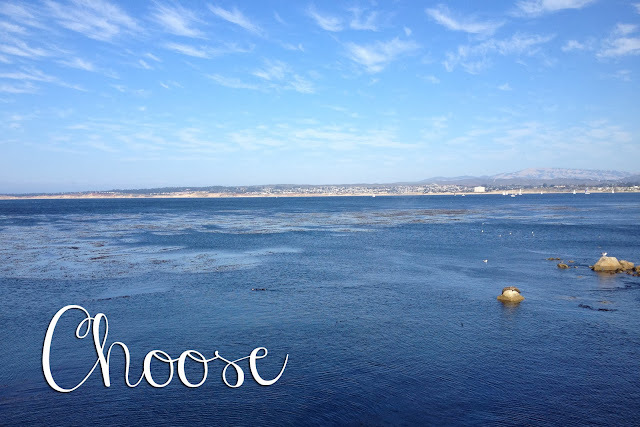 Photo taken by me in Monterey, California from Fisherman's Wharf in 2013. Every year I choose a word that is sort of my mantra for the year. And actually, this will be my fifth year doing this!! I usually give it several days or weeks worth of thought what my word should be and this year was no different. 2014 is looking to be interesting.... so I wanted to pick a word that embodied how I am feeling about all the things that are in front of us. So I decided on the word CHOOSE. To me this is mostly about choosing how I respond to things and making good choices.... and doing them with intention. My words in the past have been.... Adventure (2013), Enjoy (2012), Live (2011), Love (2010), and Create (2009). What is your one little word or your New Year's resolution?